The students of the Istituto Europeo di Design (IED) in Turin will be returning to the Geneva Palexpo once again, as has become a recent tradition, this time though they have taken on possibly their biggest challenge so far: to reinterpret a sport coupé that marked a milestone in the history of Italian motoring, the Cisitalia 202. The students of the Istituto Europeo di Design (IED) in Turin will be returning to the Geneva Palexpo once again next month, as has become a recent annual tradition; this time though they have taken on possibly their biggest challenge so far: to reinterpret a sport coupé that marked a milestone in the history of Italian motoring, the Cisitalia 202. 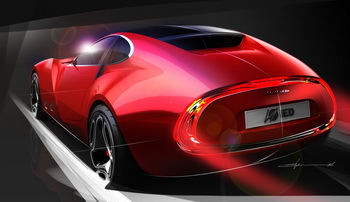 With this latest project (the concept has been dubbed the Cisitalia 202 "E"), from the Master of Arts in Transportation Design course the students have redesigned a mythical dream-car, the Cisitalia 202, intended originally to be just a car but which has gradually become an icon of design and of the elegance of the period after the Second World War in Italy. Acclaimed by Henry Ford II as "the most beautiful Italian car I have ever seen," the small Gran Turismo was commissioned in 1947 by Piero Dusio, founder of the Cisitalia brand. Designed by engineer Giovanni Savonuzzi, the car was styled by personages such as Battista 'Pinin' Farina, Castagna and Vignale. Cisitalia was subsequently revived in Argentina by Alberto Díaz Lima and Carolina Dusio, daughter of the founder Piero, who focused her attention specifically on reproducing the famed Sport Coupé, now on show at the MoMa in New York as "sculpture in movement". The original 202 was powered by a small 1089 cc, 4-cylinder in line engine with a power output of 55 bhp at 5500 rpm and a speed of 165 km/h thanks to a weight of just 780 kg. As its name suggests, the 202 E – where E stands for evolution - was intended to be a modern reinterpretation based on Cisitalia first 1947 proposal. world-premiered at the Geneva Show, the lines and shape of the concept express typical refined, creative design 'Made in Italy', with an eye on the future of the brand. The Cisitalia 202 E (length 4270 mm - width 1850 mm - height 1240 mm - wheelbase 2650 mm) is a compact 2-seater sport coupé with 19” wheels, a compact V8 front-mounted engine and rear drive, designed to deliver a power of around 450 bhp. The concept faithfully reflects the design of the historic vehicle, with dimensions and power aligned with modern times. A very low centre of gravity and compact volumes make this an enthralling, exciting car to drive. The nose and rear recall the original grille and spare wheel cover through integration of various functions in the hood-trunk division lines and in the head/tail lights. The style proposed by IED car designers echoes the sleek, uncluttered look of the original icon, transforming a modern proposal into an authentic, refined interpretation of the past. "To encourage our students to overstep their limits – declares César Mendoza, Director of IED Turin – they must have the possibility of developing exciting, ambitious projects. What greater challenge than to redesign one of the most beautiful cars in the world? An extraordinary opportunity. Taking advantage of this occasion and with the support of Cisitalia and the commitment of lecturers and coordinators, we have achieved outstanding results not only with regard to the life size model of the vehicle but in all the projects proposed, making it extremely difficult to single out that to be presented in Geneva." "When the Istituto Europeo di Design – states Alberto Díaz Lima, Cisitalia Holding SA President and CEO - asked me to participate in this project, I never imagined it would be such a fantastic experience. It has been a real pleasure for me to share such an ambitious restyling with the IED and the students of the Master course. The presentation at the Geneva Motor Show is a further incentive for the Cisitalia marque and for its future business plans." The Cisitalia 202 E is the offshoot of the work of eleven students of the Master course coordinated by Luca Borgogno, Pininfarina Lead Designer, and Luigi Giampaolo, Maserati Designer. The Master of Arts in Transportation Design – work experience is a highly qualified, two-year course intended to train competent automotive professionals able to approach the world of work through a constant rapport between companies and style centres. The concept is, in fact, the outcome of a process comprising various phases of assessment that simulate a real working situation: starting from the eleven design proposals, all the models have been reproduced in clay in 1:4 scale, subsequently selecting that which complied most effectively with the initial brief of the company. The entire class, divided into groups, then worked on the project selected to complete all the internal and external details of the concept. The Cisitalia 202 E stems from an idea by Chen Chin-Hsuan (Taiwan) and the project involved Shaaz Abbasi Bin Saeed (India), Yaroslav Chumachenko (Ukraine), Yo Kobayashi (Japan), Vasily Kurkov (Russia), Andrea Leoncini (Italy), Pasquale Meli (Italy), Soowan Park (Korea), Yoon Seul Ki (Korea), Daniela Spina (Italy) and Soohan Yun (Korea) as well as Alessandro Belosio and Luca Dazzan. The Cisitalia 202 E was developed with the cooperation of: Pirelli and OZ Racing.